Are you an SEO looking for a way to increase the quality of your backlinks, while decreasing the time and cost needed to create them? If you want to get rank-impacting Tier-1 links that are built by hand from 150+ high PageRank Web 2.0 sites - but want to do it 9x Faster with 100% Reliability - then you'll want to keep reading. I'm sure you know that time spent building high quality links to your money sites is one of the most profitable activities you do. As long as these links stay active and pony up lots of link-juice to your money sites... They directly translate into higher rankings, more traffic, and higher passive income for you. I wanted a faster way to get more of these evergreen links in my own business - but at the same manual-built quality. I call it Autofill Magic, and it’s become my secret weapon. But WITHOUT error-prone fully-automated tools or the SEO 'footprint' they leave behind, which could drop your money site from the rankings like a bird from the sky. Simply put, this is a new approach to link building that builds quality links and saves you time and hassle. Which translates into more money in the bank at the end of the month. Autofill Magic allows you to control quality, while totally automating the drudgery that comes with building quality links. The beauty of Autofill Magic is that it uses your good-ol Firefox browser - but it turbo-charges the process of creating and remembering accounts, and posting quality content. It is intelligent and easy to use. All by itself, it fills in registration forms, logins and posts, in ALL tabs (including CAPTCHAs)... with one click on the Autofill Magic Toolbar. No need for copying and pasting and remembering logins. You or your outsourcer then verifies the information is correct and complete. Then you hit submit, and it's done. A one hour job turns into less than 10 minutes, and it's done RIGHT. More than 150 highly-respected Web 2.0 sites are supported right from the get-go. And Proxies too, of course. You're going to love this... If a Web 2.0 site changes the form design on their site, automated submission tools usually feed back errors. But with the Trainer, any field that fills incorrectly can be fixed by simply right clicking the form field, and letting Autofill Magic know what needs to go there. Either way, you won't have to wait for a major update of the software and you can add any new sites you like with just a few clicks. Are you beginning to see the power of this new approach? I know that the best way for you to see how easy it is to use Autofill Magic and the Autofill Magic Trainer is to try it out yourself. Autofill Magic has only been available to a small audience so far. I'm offering this $0 trial for a limited time because I want to gather more testimonials for Autofill Magic from the wider SEO community. Once I have enough, the free trial period may end. So take advantage to build as many links as your heart desires in 7 Days, and pay no money now. In fact, I encourage you to take this chance to set up an entire network with all 150 sites, which can easily be done in the trial period. All you have to do is click the link below and sign up for one of the plans. I'll send you a licence key to use Autofill Magic right now, for free. Then you give it your own 'test run'. Use it as your own for a full 7 Days. If it doesn't save you a dozen hours this week, if it isn't the easiest SEO tool you've ever used, or if you just don't like the font I used on the interface... then just log in to your account at the website and cancel. No hard feelings. Before the trial is up, I even send you a reminder note so you don’t forget to cancel. By taking the trial you'll get to see the incredible flexibility of Autofill Magic first-hand... try the unique Autofill Magic Trainer for yourself and see how cool it is to automate ANY website sign-up or content-insertion process, including your own private blog networks. Register once at the regular speed... Use the Trainer to teach Autofill Magic what to do... Then do it the next time at 9x the speed. I'm sure you can imagine how useful Autofill Magic would be to an outsourcer. Let them try it out too, and see how one outsourcer with Autofill Magic can do the work of three or four outsourcers. Click here to start your 7-Day trial now for $0. I’m an SEO veteran like yourself and a software developer. Before I created Autofill Magic I was using several fully automated tools. The tools promised to save me tons of time, but I always had to spend time tweaking settings and finding my way around hard-to-understand user interfaces. I also realized that automated tools are not very clever. When it comes to building high quality links and you NEED them to stick around, the fact is that automated tools aren’t exactly up to the job. and the chance that you're leaving behind an automated 'footprint' that Google can detect, which could slap a spam penalty on your most profitable money site overnight. You also get lots of infuriating errors, false positives and false negatives when posting and signing up for accounts. Doing everything manually was one option, but it's painfully inefficient and time-consuming. And not a great use of an outsourcer's time. Then I started to look into form fillers. I had more control of the process and the success and stick rate was much higher than automated tools. I did a bunch of successful campaigns with them. First of all, they needed to be set up to work with any forms. This required knowledge of html, regex and other neerdie skills, and above all it was very time consuming. Yet I did it, and the effort paid off for me. I could now post videos to any platform and did some very successful campaigns. What if if you could create a form filler especially designed for SEO work that addressed all the issues that form fillers had? That's the day I started work on what would become Autofill Magic. It has been in development for over 2 years now, and since development started there have been 36 major updates. It has cost over $35,000+ to develop. I'm constantly working on it to make my own life easier. Over the past few years my private clients and I have used it to shoot our money sites to the top of the rankings for many competitive keywords. Recently, I had the thought that others in the SEO community at large would want to use it as well. But since there are SO many markets online and the few I'm in already make me a small fortune... I'm now sure my main business won't suffer one bit from allowing others to use it. So this is a win-win situation, and I hope you love Autofill Magic. With The 15-Minute Autofill Magic Challenge! You can download the software right now with no payment, and I challenge you to build a small network of 5 Web 2.0 Blog accounts just like in the Prof video above. ...in just the first 15 minutes (it will take a little longer than in the video the first time you try, but no more than 15 minutes). To start building sites, all you have to do is choose a package below, and sign up for the trial. Download and install the Firefox plugin, and activate your license in the plugin. 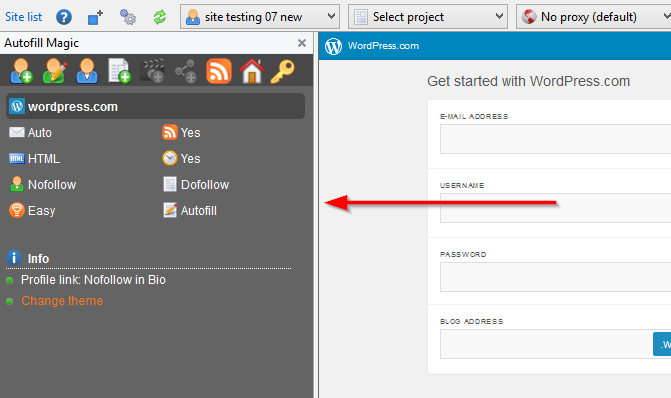 A sample profile with a pre-loaded article is available as soon as the plugin is installed. If you want you can add you own article and links and benefit from the created links right away. Now, all it takes is just 7 simple steps - just like in the video. An in depth step-by-step tutorial is available as soon as you sign up. We explain every step in this easy to follow tutorial. Prepare a profile and create an email. Use the pre defined profile My first 5 sites to get started then create a new email address and add it to the profile. Signup for accounts. See how Autofill Magic can open all 5 sites and fill all the forms in just a few clicks. Then complete the sign up for each page. Email verification. Email verification is extreme easy. Just click the verify email button and Autofill Magic will take care of fetching the emails and clicking the verification links. Auto-login to all sites. In this step we take advantage of Autofill Magics ability to log in to several sites at the same time with a single click. Posting content. Now we are ready to post some content. We will navigate to all 5 posting pages and fill in the article at all pages with a single click. Collecting your links. The links to the blog homepages are saved automatically. In this step we collect all the individual article links just by navigating to the articles and then clicking a single button. Generate a report. whether you are working for clients or on your own projects it is nice to see a well organized report with all the created backlinks. With Autofill Magic generating a perfect report takes just a few clicks and you can choose exactly what you want to include and what you want to leave out. It is a simple copy and paste operation to get the report to your favorite spreadsheet software. You've just 'Manually' created 5 Web 2.0 Tier-1 links - in about 10 - 15 minutes, and 7 steps. Remember: Autofill Magic keeps track of every account you create in it's own database, so you can update them in seconds whenever you have new articles to post. You can do 10 sites in 10 minutes once you get the hang of it - or even more, if you open more tabs at the same time. You just need to pre-load your own articles in a folder. And it's simple to give to SEO outsourcers - just send them the licence, and point them toward the comprehensive video training section. You can use CAPTCHA solving services as well as Proxies to create large volumes of accounts. Proxies ensure you'll never be banned for creating too many profiles at one site. By the way, Autofill Magic can also keep track of what proxy you used for each profile, if you want to make your logins seem more legitimate. It's as safe as you can get, but still fast. It's simple really: success in the SEO business is about finding what works, and then scaling that up as much as possible. If you're going to finally make serious money in SEO, you're going to have to ramp up the things that already work for you. You already know that creating rich content on authority Web 2.0 properties is effective to drive your rankings and traffic up. And with more traffic, comes more profits. So don't miss this chance to ramp up the processes that are already effective for you. I'm not going to go into an in-depth SEO lecture... But in Google the #1 spot gets ~40% of all traffic... #2 gets about 20%... #3 gets about 8%.. And less and less from there (though #10 typically gets higher than #9 because it is at the bottom of the page). Even if you get only a fraction of the results that my clients and I have been getting, imagine how a boost from, say, #12 in the rankings up to the top 3 spots could affect your bottom line profits. Imagine using this tool to out-compete your competitors in the rankings: When they use automated tools, they lose a lot of link juice to software errors and SEO 'footprints'. None of this is a problem with Autofill Magic. The quality of your backlinks is just like a manual submission, but you still get the speed and volume of an automated tool. Give this to outsourcers to make their lives easier. They'll feel like they can get more done than ever, with less stress. They'll feel like a more valuable part of your business, because they will be. And with all the training videos provided, they'll be up and running in just a few hours (as long as they already know how to use Firefox). With little or no coaching from you. So as I said, I'm offering my personal Autofill Magic software for a $0 trial basis because I'm currently testing the market. The Autofill Magic Plugin for Firefox. The Autofill Magic Trainer Plugin - a separate plugin that 'Trains' autofill Magic. Still not convinced to pick up the Free Trial? 5 minutes after you download Autofill Magic, you can start creating accounts and posting your content to sites in the Autofill Magic collection. There are also many German, French and Spanish sites built-in. Autofill Magic has no language barrier, which makes it great for doing local SEO in non-English countries. Here's where the rubber meets the road... Autofill Magic uses multiple threads to fill forms and solve CAPTCHAs in ALL open tabs, instantly. So... you can fill as many forms as you have open tabs. Imagine how powerful this can be. Open 100 registration pages and fill all of them with a single click... No need to repeat the process 100 times. You are not limited to navigating a single site at a time, either. This is a great time saver. 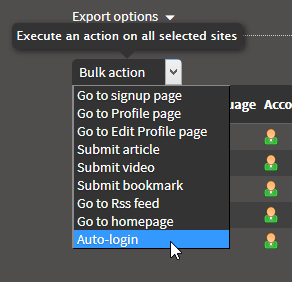 From the online site list you can auto-login to 100 sites with the bulk action menu. When you are logged in you can navigate straight to the posting page for all the sites. So with a few clicks you will have logged in and navigated to the posting page for all the sites. All that is left to do is to chose 'Autofill forms in all tabs' to make the posts. Next check each site/tab and post the article. That's it - you have updated 100 blogs in 5 minutes. Do you have a 67 year old Aunt who would like to use Autofill Magic? Even if her computer skills are limited to playing Candy Crush Saga on Facebook, I'm betting she would be putting up posts all around the Internet just a few hours after downloading the plugin. Autofill Magic is designed to be intuitive and simple to use. You have instant access to all features of Autofill Magic right from the Toolbar in Firefox. Everything you need is only one click away. As somebody who already knows how SEO works, you'll be able to download it and figure out how to create accounts, login and post to sites without doing any head scratching. The settings panel contains everything you'd expect for SEO, and nothing more. There is no need for coding skills to set up the plugin. Just insert your profile information, insert your articles, videos and tags... and Autofill Magic will work. Just try it for yourself. So I've created 25 In-Depth Training Videos on every aspect of the software for you. You'll never be left wondering how to use it, or be stuck emailing back and forth with an overseas support team like you might with more clunky automated software. The videos are not only helpful for showing you the functions of Autofill Magic: They will give anyone new to building web properties (eg. An outsourcer) a savvy, streamlined workflow. Every detail is outlined, and even relevant keyboard shortcuts are taught. In only ~2 hours, your outsourcers will be experts in this software, and they'll be out creating property after property for you. For example, you once had to fill in every field of your account such as the city, the birthday, the name etc, in order to make each profile look great. Now, you can simply press the 'Populate Fields' button, and Autofill Magic fills in every field by itself, instantly. It also 'Randomizes' each profile. If you don't randomize the profiles of each account, you could leave a traceable SEO 'footprint' behind on the accounts you create - and that could get your properties deleted. Or worse, Google might penalize your money pages in the rankings. To prevent that from happening, Autofill magic uses Spintax and special ‘randomization markers’ to automatically randomize every field, for every account you create! ANY website/platform is supported with Autofill Magic. Just use the Autofill Magic Trainer to automate login and posting to any site you like. Just click the Autofill Magic button on any new site. Autofill Magic will try to guess what to put in. If Autofill magic can't fill in the form correctly (eg. It may insert a username into a Full Name field), then you can just right click in the form field and tell Autofill Magic what needs to go there. From then on, it will remember what needs to go there, so you can automate the process. This way, you can fix broken form fields on the fly. When an included site changes design, for example, you can fix it yourself without waiting for an Autofill Magic update (NOTE: you can also report any issue with a form, and it is usually fixed within 24 hours). This feature allows you a lot of flexibility. You'll be able to put links on web properties that none of your competitors in the rankings have links on. That's because they're usually using automated link building tools or outsourcers who use those tools... and they only post to a specific group of sites that are supported, over and over again. The best way to see how easy it is to use is to try it yourself. Today, you can try it out for $0 for 7 days, so take advantage of that while you can. You can use Autofill Magic to set up your own personal blog network, and keep it updated. Simply add a new Site Note for each of your blogs using the Trainer (don't worry - there's no complicated configuration like there is with many automated plugins - this takes about 5 minutes per site, and you'll see exactly how to do it in the training videos). After you add the Site Note, you or your outsourcers will be able to manage and post to the sites in bulk. What might take hours to maintain every week manually will now take minutes. 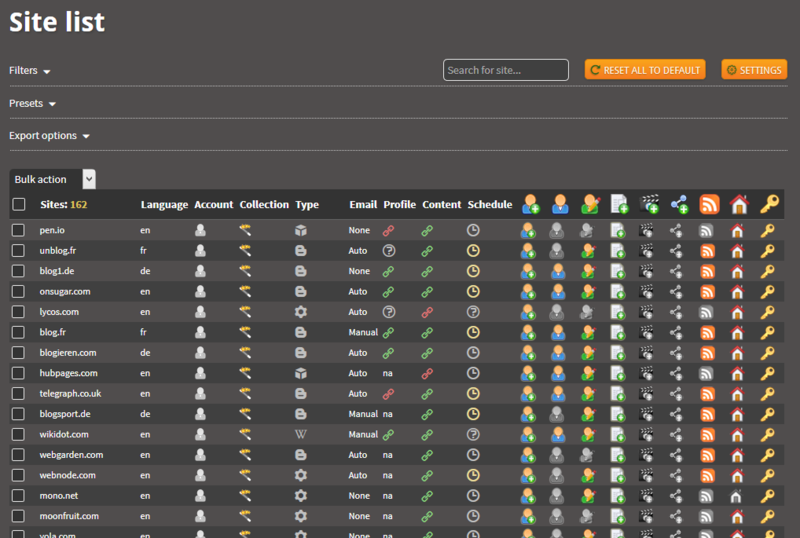 Download the plugin for free and see for yourself how easy it is to maintain your own networks. Managing blog networks can be painful because it requires big spreadsheets, lots of note taking, and lots of copy and pasting to create accounts and posts. 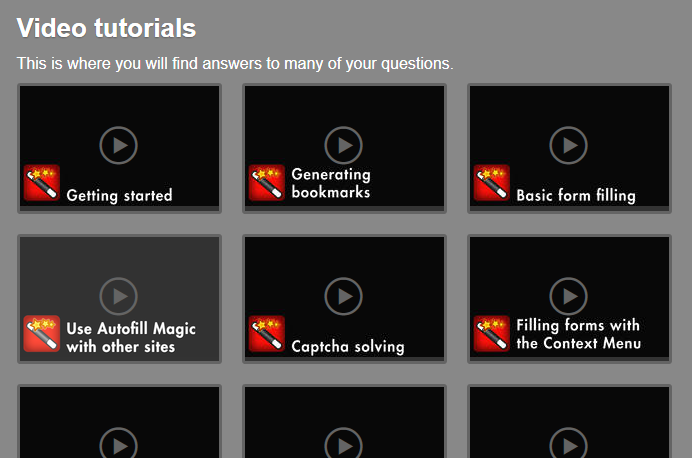 To make that task easier I created a dynamic list with all the sites in the Autofill Magic collection... This list continually updates when you create new accounts and add links and posts. In this list, you have access to all information about the sites and direct links to all key pages. It can be easily customized and filtered to display only what you want to see. You can also see the links you have created already and profile information for each account. The list is updated as you create accounts and links with Autofill Magic, so there's no need for tedious note taking and manually maintaining a spreadsheet. Any sites you add with the Autofill Magic Trainer are automatically added to this list, too. This is a very powerful dashboard for your campaigns and it gives you a perfect overview of your project. You often need to perform the same action for several sites. When you are signing up for accounts you need to navigate to the signup page for all the sites where want to create an account. With bulk actions you can do that for many sites at once. Just tick the box beside the sites that you want to work with and choose a bulk action... For example, if you want to sign up at a bunch of sites, choose "Go to sign up page". That will open the signup page for all selected sites in new tabs. Now you can use the 'Fill forms in all tabs' feature, then and submit each form. By adding all sites at once instead of filling each form one-by-one, I'm sure you can imagine how much time you will save. Auto-login to all sites from the site list. There's no need to Auto-fill any Login forms, though - Autofill Magic can log you in to any site with a link from the Site List, or to all the sites you want using the 'Auto-Login' option in the Bulk Options menu. Of course, I'd never want you to go out there and start link building without the safety of Proxies. So I've built full proxy support into Autofill Magic. To add proxies, all you have to do is download a list of proxies and copy/paste them into the software. Then you're done. Many sites may ban you if you create too many accounts with the same Internet IP address. By using proxies, you avoid getting banned. You'll stay under the radar. You can also assign a specific proxy to each profile, so it seems like you're logging in from the same location every time. This makes each of your accounts seem more legitimate, and adds to the stick rate of each of your web properties. To automatically verify emails, first create a new email address with Autofill Magic. This takes about 25 seconds. Then add the new address to the Email Verification tab. After that, all you have to do is click Check Email For Selected Profile, and all the emails addresses you've added are checked, and verification links are automatically clicked. You can see the status of the links that have been clicked right inside the same window. Now, there are some sites that require more than just clicking on a link in an email for verification. These verification emails are sent to a special list so you can take manual action. 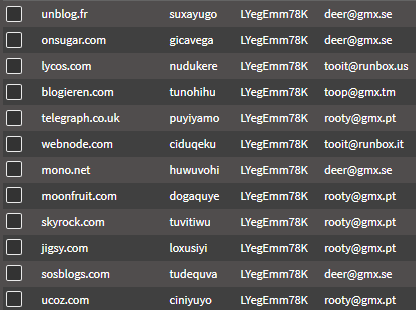 Most other tools just report an error when verifying these emails or simply exclude these sites. But not Autofill Magic! I want the highest possible success rate so I’ve built in this extra step to achieve it. If you add a custom site and you're worried that the emails won't be verified properly, you can easily add custom filters. Avoid duplicate content penalties with unlimited levels of nested spintax. Not only for articles, but also for any field. This is a must to ensure that your accounts and posts are 100% unique! Ordinary spintax is a pain to read and edit and there are limitations to the level of uniqueness. That is why I've developed a new way to write articles that are unlike anything seen before. outputs 100% readable articles that will pass both Copyscape and a manual review. No need to upload every article you're using to the software. Just add a group of articles to a folder on your computer and tell Autofill Magic where the folder is. The articles may use Spintax if you like. Then, you can specify Autofill Magic exactly how many times it is allowed to use each article. For 100% unique Web 2.0 sites, you can tell Autofill Magic to post the articles only once! Full support for Decaptcher, Death By Captcha, and Captcha Breaker, so you never have to spend time solving annoying CAPTCHAs! Autofill Magic will automatically solve ALL CAPTCHAs in every open Firefox tab. There's no need to navigate to each page and apply CAPTCHA solving. 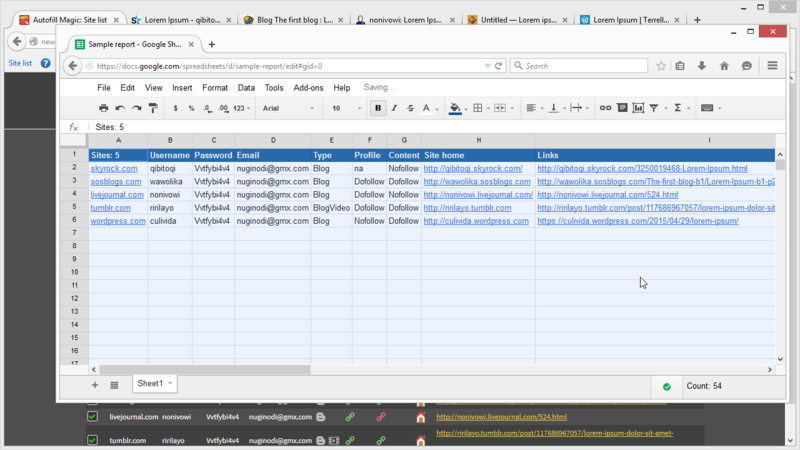 Output the links you create into a list so that you can build backlinks to them. It can be used to keep track of your work, or deliver detailed reports to SEO clients. Autofill Magic lets you choose exactly what details to include in your report and you can export it to any spreadsheet software. The Site Notes are a special feature of Autofill Magic that provides a streamlined menu to all the important pages on a site. Ordinarily, finding your way around 150 different sites quickly is almost impossible. Autofill Magic provides a streamlined one-click menu with links to all key pages like the posting page, login page, the page to edit your profile etc. Also if there is anything out of the ordinary to post to a site, you can see it immediately in the site notes. For example, if a site has some special way of posting, the Site Notes will show you what to do. Keeping track of usernames, emails and password can be a time consuming and tedious task to do manually. Whenever you sign up for an account with Autofill Magic will remember your details. This works even if you spin your profile details... so you can have unique usernames, emails and other details for each account, and Autofill Magic will still keep track of everything for you. You can easily edit the stored user info if you need to change something. Autofill Magic keeps track of where you have an account and where you don't. It takes all the pain out of manual account management and saves you all kinds of time. Do you already have a list of accounts that you would like to use with Autofill Magic? Great! There is no need to leave them behind - you can easily import them to Autofill Magic. You can also Export accounts stored on your computer and easily send them to an outsourcer, and vice versa. There has already been 36 major updates since development started, and it's not going to stop there! There's a lot planned. Integration with Imacros or custom scripts to allow even more smart automation of Autofill Magic. But is Autofill Magic right for you? I have been waiting for a seo tool like this for a long time. I wanted something that would create accounts and be able to post to various properties across the web, in a semi automated fashion so that I could see what was going on and have the benefits of manual and automated at the same time. I wanted tier 1 links that were quality and would stick. I also wanted to be able to fill out profile information and add an avatar that other fully automated tools lack the ability to do. Autofill Magic does just that. I purchased AFM about a month ago after emailing the owner to ask various questions about what it can/can’t do. His quick response & helpfulness helped me make the decision to purchase. Having now used the software for about a month I am very pleased I took the plunge. This really is a time saver!! The access & easy set up of Web 2.0’s are worth their weight alone.....let alone the ability to sign into so many websites using your own profiles without the constant looking up of email/username/password/login details....it just remembers! !.....& the fact that with one click you can save all the links you have created (blogs, web 2.0 etc) means that everything is in one place!! & means I don’t need the various spreadsheets I have set up over the years trying to track it all. An awesome bit of software but as I gather....has only just started!! There are loads of additions on the way....I can’t wait & am very pleased I took the plunge !! I bought the lifetime option a couple of days ago. Seemed like a no-brainer if it works like it does in the tutorials. Anyway, I've been playing with it quite a bit and I have to say I'm VERY impressed. It takes a little time to watch the videos and get your profiles setup, but after that it's smooth sailing. You click, it fills, you click again, it fills some more. How hard is that? I also really appreciate how well everything is laid out in the menu and simple it is to run your campaigns. Nothing is overly complicated and the video tutorials do a great job of explaining the components in detail. This would also be great for outsourcing as well, if someone wanted to go that route. The truth is, I don't know whether Autofill Magic will be right for you. The only way to know for sure is to try Autofill Magic out for yourself, like these people did. What I do know is that other automated tools could set you back $100's of dollars each and every MONTH. And they still might not get you the same long-lasting results of 'manual-quality' backlinks. How Much Are 'Manual-Built' Web 2.0 Properties Actually Worth To You? Link building services usually charge 5$-10$ for EVERY Web 2.0 built with unique content. The cost is due to the SEO value of the properties, as well as the manual work involved to create good web properties that stick. Yes, 100 Web 2.0 sites might cost $500-$1000 if you use one of these companies... And they're STILL worth it. The problem is, most link services only feature 30-40 sites that they commonly link to (because those 30-40 sites are the easiest to create links to...). Once you buy links from all of those sites, that's the ceiling. Autofill Magic comes with 150 sites built in, and that number is growing. You can also teach it to submit to any site you like, and it will store all your profile and content information for you. Then you can build links to these Tier-1 links through other automated link builders such as LinkEmperor or Unique Article Wizard, and you can trust that your Tier-1 links will stay up. If you built each of these pages by hand, it could take you ~15 minutes to build each one. Even at this rate, they would still be worth money in the bank, of course. But say your time is worth $10/hr, and you want to build 100 Web 2.0 sites over the course of a week. 100 * 15 = 1500 minutes = 25 hours = 250$ for 100 Web 2.0 pages at $10/hr. This is excluding cost of articles, of course! But since you can build links 10x faster with Autofill Magic, it would only take you 2.5 hours, and cost 25$. You'd save $225, just that week! And if you hired an outsourcer to do it at 3$/hr, you'd still save 67$ that week, just on that one outsourcer. Imagine how you could use this to scale your SEO business. Due to the speed and quality of Autofill Magic site creation, you will be able to create Web 2.0s for others at a huge profit margin. Being conservative, you could pay $2.5 per unique article. Probably lower in bulk. Then, say that an outsourcer might be able to create 80 Web 2.0's per day, and you'd pay $24 for 8 hrs work. That's $0.3 per property. Again, this is conservative because the outsourcer would likely be able to create more than 10 properties/hr. So in total, let's round that off to 3$ per property - cost to you. Clients would include video, images and links for you when requesting properties to be built. The going rate for creating high quality Web 2's is 6$. If you used 1 outsourcer to build 80 per day, you would make nearly: $3profit x 80Web2.0/day = $240profit/day! As I said, this plugin has recently been released to the public-at-large. Right now I'm just testing the wider market, so prices may go up soon. The lifetime option, in particular, may not be available at this price for long. So grab it now, while you can. You can take a full 30 days to use Autofill Magic. You don't need to make the final decision to keep it right now. And I wouldn't want you to. Because if you aren't completely thrilled with the results you get... for any reason or for no reason at all... simply ask for a refund. I'll hurry to send you a complete refund of every penny. No questions asked or hassles. No delay. If it doesn't produce results for you and noticeably contribute to your bottom line, I feel that I'd rather not keep your money. That's what I want from anything I buy. I can offer this guarantee because I'm betting you won't want to give it up after you see how much time and money it saves you. Just click on the 7-Day Trial button below, select the plan you want to start with, and you'll be able to input your name, email and password to create a new Autofill Magic account. You'll then be forwarded to our 128-bit encrypted server, and you can simply enter your payment details. Remember - you will only be charged if you continue to use Autofill Magic after 7 days. You will NOT be charged today. After your account is created, you will be forwarded to the Member's Section where you can Download Autofill Magic and the Autofill Magic Trainer, and access the full Site List and the support videos. Remember, if you or your outsourcers do any sort of manual SEO work, you'll immediately see how much time you'll save when you download and try Autofill Magic. If you aren't automating the repetitive parts of your link building efforts, you're burning through time and cash needlessly. And you're working too hard and keep getting the same mediocre results. They're not the results you should be getting. And Autofill Magic will provide it for you. As I've explained, you've got nothing to lose today. 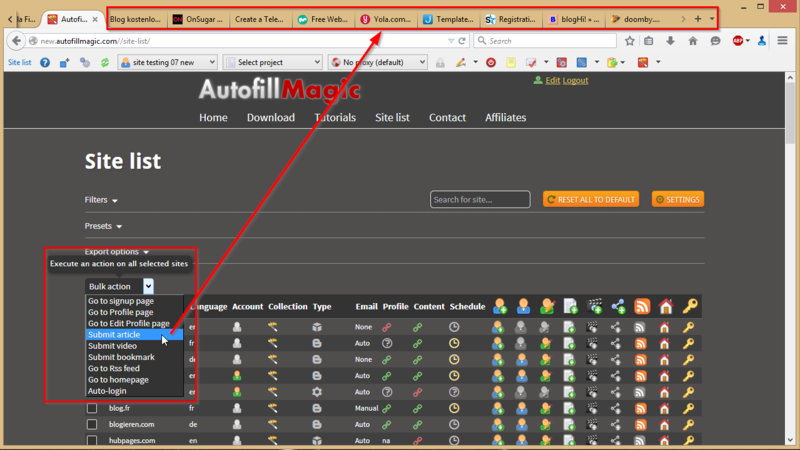 So download Autofill Magic for free and see for yourself how it can propel your money sites to the top of the rankings! Maybe You Still Have Some Questions About Autofill Magic? Here are some frequently asked questions that might clear them up for you. On how many computers can I use my license? You can install Autofill Magic on as many computers as you like. But you can only use one instance of Autofill Magic at a time. Every time you open Firefox and initialize Autofill Magic all other instances will be logged out. So you can use Autofill Magic at work, but when you login at home, you will be logged out on your work PC. Is the free trial really free? Yes! The first week is free for any new user. If you decide to cancel during the first week no money will be charged. We will send you a reminder when the free week is about to end, so you won't forget to cancel if that is your choice. Which capthca services do Autofill Magic support? Where do I find the list of supported sites? New sites are addeed all the time and dead ones are removed. So the best way to see the sites are to install the trial and visit the site list. It takes max 5 min and you can just cancel right away if you are not interested. Can I create my own notes and add my own rules for filling forms? Yes. 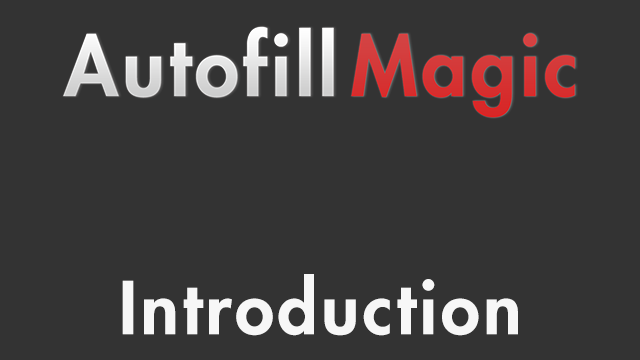 With the Autofill Magic Trainer plugin you easily make Autofill Magic work with any site. I've done my best to show you exactly what Autofill Magic can do for you. But if you still have questions about the software, you can always contact me by using the Contact page. I’m usually able to respond within 24 hours, depending on your time zone. So if what you're doing now makes $4,000 a month, for example, and you can get a very conservative 20% more good SEO content out there simply by using this software, you could potentially make $4800/month... An extra $800. In this case, the software would pay for itself within only a few days. Not to mention the stress and hassle it saves from doing it by hand or using automated tools. Remember, you don't have to decide today. It's free to download and try the fully functional plugin. And even after the 7 day trial period, you have 30 days to try the product with no risk to you. If you don’t absolutely love it for any reason, just send me a an email and ask for a full and prompt refund – no worries!